REVOLT Music Conference offered a weekend filled with entertainment and education for music industry executives and students. Live performances by Ne-Yo, DJ Vice, Jhene Aiko, G-Eazy and more were enjoyed by guests along with over 40 speakers including sessions by Bob Pittman, CEO of Clear Channel and MTV Co-Founder; Def Jam's Russell Simmons, and co-founder and CEO of Beats Electronics, Jimmy Lovine. 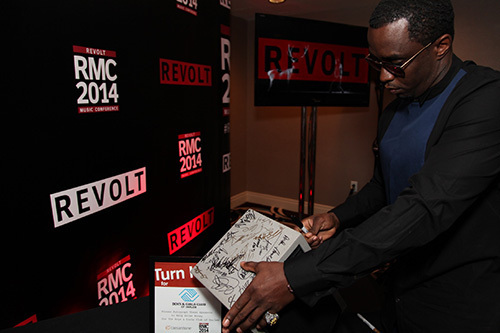 Sean Combs, speaking on behalf of Combs Enterprises and REVOLT TV took the opportunity to sign a pair of speakers in Caesarstone quartz. The speakers will be auctioned off from October 20th - November 14th. Proceeds going directly to the Boys and Girls Club of Harlem. Boys and Girls Club of Harlem is dedicated to providing after school access and summer programs in education, youth development, character and leadership. Boys and Girls Club of Harlem offers three locations serving over 3,000 children annually.